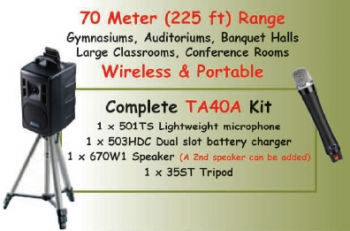 OKAYO TalkAbout TA40A Portable PA Kit is perfect for Gymnasiums, Auditoriums, Banquet Halls, School Classrooms, Conference Rooms and or just about any place where amplified sound is required. This LIGHTWEIGHT system is totally wireless and battery operated. The complete kit can be carried easialy with one hand even by a young school student. The Powerful 40watt speaker can be set on a table, or set-up on the included Tripod. Plus it has an audio in port to hook up other audio devices and an audio port port for sound out. You can use the Audio Out port with an induction loop system giving direct amplified sound to peoples t-coiled enabled hearing aids. For greater sound a 2nd speaker can be added.